India is a biggest marketplace to get the ready made garments / clothing and attracts buyers from across the globe. These international buyers can approach the jeans exporters in India directly to deliver their products to their destinations. Denim Vistara Global Pvt. Ltd. manufactures and exports its jeans to nationwide and worldwide. Denim Vistara is a trusted brand in India which can be exported to anywhere in the world easily. If you are a buyer outside India and wants to know the full cycle of delivery process, you can directly contact to export department of the company and ask for the quote also. Since, Jeans export in India is a very good opportunity to get customized Jeans on demand to overseas buys. Jeans exports in India are really pioneer in providing excellence in stylish, comfortable denim Jeans which comes at reasonable rates. However, bulk jeans exports from India gives additional discounts or bonuses which makes sense why overseas importers wants to buy from India only. 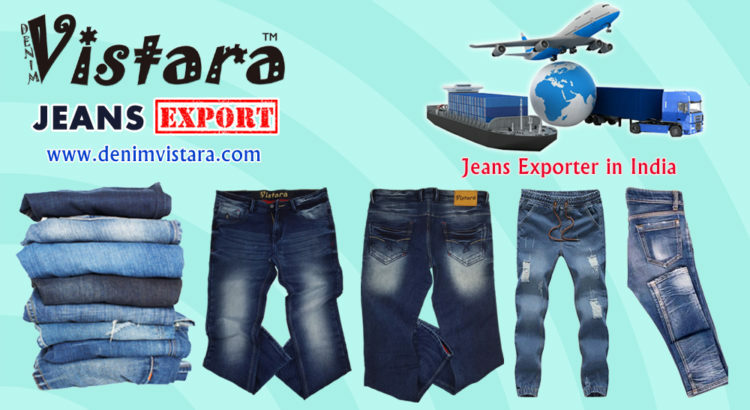 While delivering the Jeans export orders , Denim Vistara Global Pvt. Ltd. covers all areas of transportation like Road, Air or Sea. All the shipments to other countries are passed from proper custom checkups after completing the regular taxes and liabilities which are always remains fair in all type of deals whether its small orders or large orders. If you are willing to export Jeans from India, Denim Vistara is a good choice because of their commitments and reliability. The Procurement of all type of Jeans is the expertise of Denim Vistara Global Pvt. Ltd. whereas this company manufacturers the custom made orders with its excellence.